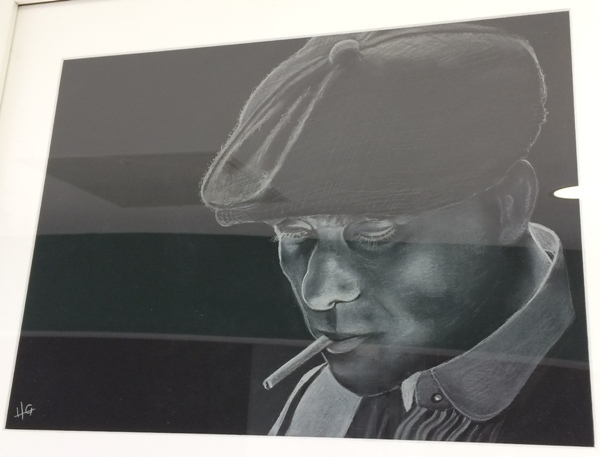 Visitors will come face to face with Peaky Blinders' Tommy Shelby at a new art exhibition at Dudley Canal and Tunnel Trust's Waterside Gallery. The pastel portrait of the character from the hit TV series (pictured below) is by artist Hazel Gillard who is exhibiting her work alongside that of Jacqueline Bradley. The free exhibition continues at the gallery in the Portal Visitor Centre till February 28, 2018. Talented artists Hazel and Jacqui take inspiration from all around them, from favourite landscapes and local scenes, to family and television programmes like Peaky Blinders. 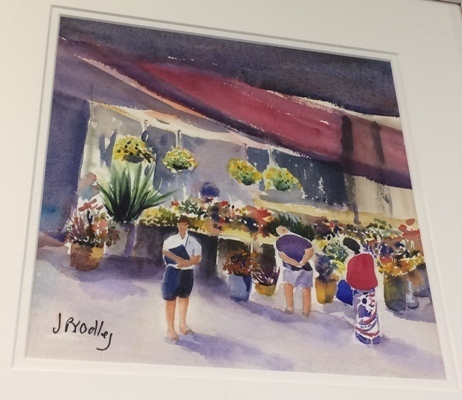 Jacqui's watercolours evoke memories of countryside walks and bring local market scenes, such as The Flower Seller (below), to life. Hazel's pastel portraits are intimate and dramatic. "Much of our time is spent in going from one place to another, encountering an array of people; family, colleagues, friends and strangers," says Jacqui. "People and Places is a collection of our artwork depicting fond memories and vivid recollections of those places and moments in time as we pass between them," adds Hazel. Jacqueline was born in Kinver, and from an early age was inspired by the countryside of the West Midlands, as seen in paintings such as Murmuration of Starlings (below). 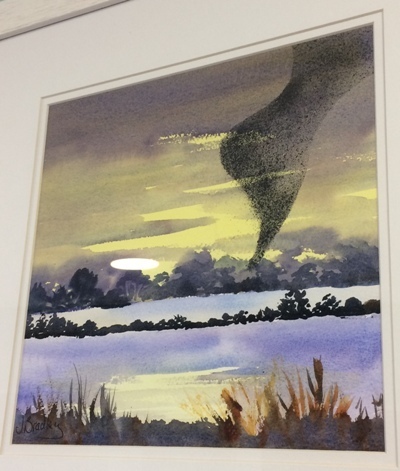 She is self-taught and uses watercolours to bring her scenes to life. Many of Jacqueline's works are painted outdoors from direct observation, and she takes a sketchbook with her everywhere she goes so she never misses an artistic opportunity. She is a member of the Birmingham Watercolour Society, the Hagley Art Club and the Brierley Hill Society of Artists. Netherton-born and bred Hazel has always had an interest in art but took up painting later in life, attending local groups and becoming a member of Hagley Art Club and the Brierley Hill Society of Artists. 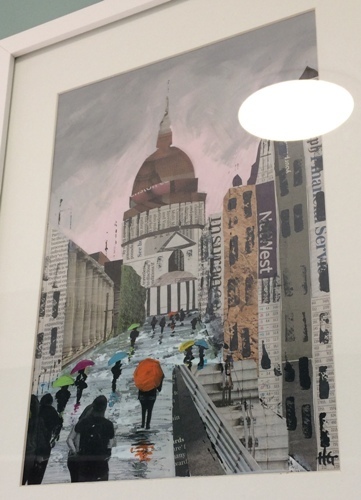 Hazel likes working with different media, for example using collage in Rainy Walk to St Pauls (below). In her portrait inspired by Peaky Blinder Tommy Shelby, she uses pastels to create a dark and dramatic atmosphere. "We are delighted to be able to display Hazel and Jacqui's beautiful artworks," says Holly Wain, Heritage Activities Assistant at Dudley Canal and Tunnel Trust. "Most of these original artworks are for sale, priced from £65 to £140, so you can take home your very own Black Country creation." People and Places is free to visit until February 28, 2018, in the Portal Visitor Centre, 501 Birmingham New Road, Dudley, DY1 4SB (pictured below).